The collapse of the housing market has claimed yet another victim. The 80 luxury condominium Griswold Project that was set to be built above the new 10-story Book Cadillac parking garage has been scrapped. 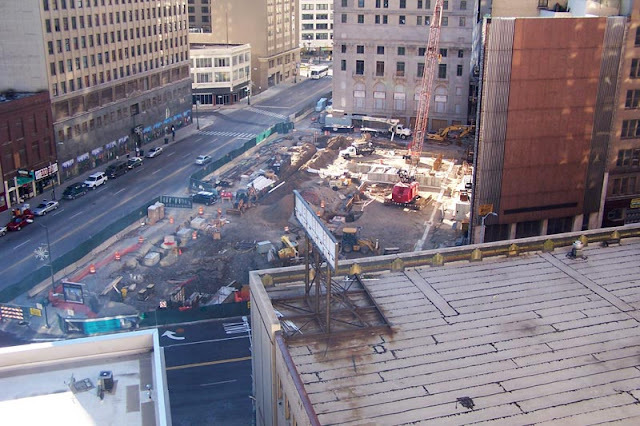 The Detroit Downtown Development Authority and the Roxbury Group must pay $1.5 million after canceling an order for Steel and precast concrete molds. Slow sales have at best, delayed the project, but the group is willing to reconsider the deal if the housing market improves. Only nine units had been sold by December 1st, with another seven set to be sold. This was not enough to meet the requirement that 20 units be sold by the end of the year. An extra $750,000 was spent by the city to reinforce the garage so condominiums could be built on top. Remnant, originally uploaded by A Dubs.